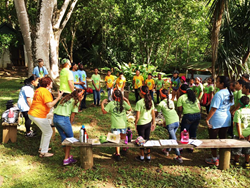 Once again this year twenty-four young Belizeans received an in-depth environmental education adventure in a pristine rainforest setting courtesy of The Lodge at Chaa Creek’s annual Eco-Kids summer camp. The weeklong free educational summer camp, held at Chaa Creek’s Macal River Camp between 16 to 23 July 2017, is a labour of love for owners Mick and Lucy Fleming, who since 2001 have sponsored the camp as a means to “Give young Belizeans an opportunity to learn about their natural world and cultural heritage while instilling a sense of wonder and responsibility for the environment,” Ms Fleming said. The innovative summer camp, officially called the Eco-Kids Scholarship Environmental and Cultural Exchange Camp, sees students between the ages of nine and twelve learning about biodiversity, conservation, the ancient Maya, sustainable agriculture and a range of other subjects through structured learning activities that combine games, nature hikes, creative exercises and teambuilding. Education has always been part of Chaa Creek’s commitment to sustainable tourism, she said, with onsite resources such as the Belize Natural History Centre, Blue Morpho Butterfly Breeding Exhibit, Maya Organic Farm and Medicinal Plant Trail popular with overseas visitors as well as local guests and students. “Fostering an appreciation of nature and culture is an essential a part of true eco-tourism, and we realised early on that eco-resorts are particularly well positioned to offer educational experiences to overseas guests and local communities as well. “We’ve have people of all ages and backgrounds say how much they enjoy our educational attractions, and watching young Belizeans expand their horizons during the Eco-Kids week is something we all look forward to each year. “We take a holistic approach in immersing the kids in nature while teaching about sustainability, environmental protection, recycling, and related subjects, and combine that with structured activities that help develop their creativity, teamwork and confidence. The goal is to give these young people the skills to be effective and confident environmental ambassadors,” Ms Fleming explained. In addition to studying nature and the environment, Ms Fleming said the Eco-Kids also learn to appreciate Belize’s diverse ethnicity and cultural history. During the week, the Eco-Kids enjoy activities such as guided horseback and hiking expeditions along the trails crisscrossing Chaa Creek’s 400-acre nature reserve to study Belize’s flora and fauna, Maya medicinal plants and visit ancient Maya archaeological sites. They learn about recycling and sustainable organic farming techniques at the onsite traditional Maya organic farm, and enjoy supervised water games, song writing sessions and talent shows. “We worked with teachers, guides and our staff to design a well-rounded weeklong learning adventure that we hope will instil a commitment towards environmental stewardship and civic responsibility in some of tomorrow’s leaders,” Ms Fleming said. To become an Eco-Kid, Belizean students across the country are asked to submit a 300 word written essay for consideration by Chaa Creek’s scholarship committee. Shortlisted essays are then entered into a draw, with twenty-four winners going on to attend the summer camp. Chaa Creek provides lodging in the Macal River Camp’s bungalow style “casitas”, three healthy meals and snacks each day, arts and craft materials, tee shirts, 24 hour supervision by camp counsellors, with educational activities and guided tours conducted by licensed naturalist guides. Ms Fleming said she and her husband consider sponsoring the camp as an investment in the future. “We believe that giving twenty-four enthusiastic young people a deeper appreciation of the natural world and Belize’s cultural history creates a ripple effect that extends to their families, friends and schools. We’ve seen the look on their young faces as they engage with nature, learn about environmental issues and realise that they can become part of a global movement. They come to understand the challenges the world faces, but they also see that they can become part of the solution, and that’s a very exciting feeling and a sound investment in the future,” Ms Fleming said. “And to be honest, Mick and I and the counsellors seem to enjoy it as much as the kids do. It’s become something we all look forward to each year,” she added. Ms Fleming said further information about the Eco Kids Summer Camp can be found on the Chaa Creek website and Belize Travel Blog. The Lodge at Chaa Creek is a multi-award winning eco resort set within a 400-acre private nature reserve along the banks of the Macal River in Belize. It was recognised by National Geographic with first place honours at the 2017 World Legacy Awards held in Berlin.